Books by Carol Wellman at Barnes and Noble for downloading to Nook./ Books by Carol Wellman at Amazon.com for kindle. Hi, my trail name is Brawny. Please come in, take off your shoes , look around, and make yourself comfortable. and designing and sewing custom ultralight backpacking gear. Recently I've learned to ocean snorkel. You can read about those water adventures in 2007 and beyond. Scuba diving could be next! Life holds no promises; I believe we ought to be active participants in our own destinies, leaving fate to those who linger in doubt. May all your adventures both inspire you, and keep you young. 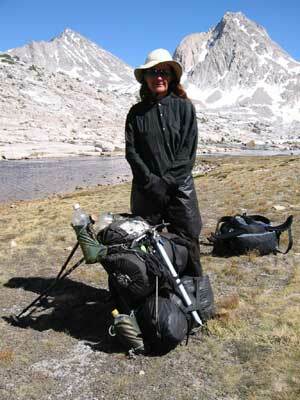 This photo was taken below John Muir Hut, 6 weeks into my PCT hike in 2001. My packless system is getting a good workout. See my ice axe strapped to the various silnylon sacks, and water bottle carriers cinched to 4 corners of the frame? Check out more details on the The Packless System for an easy way to modify an external frame. --My book about my journey to personal freedom, and my adventures on the PCT, JMT, and AT. The second half of the book is all about my ultralight techniques, with directions for making your own gear and gear lists. Now available for Kindle and PCs at Amazon.com You don't need a Kindle to purchase e-books. There is a free download for PCs. If you have a Nook, you can get the books at Barnes and Nobel. --a culinary guide for backpackers is full of trail stories, recipes, photos, and information for everyone. Published in 2011. E-books are available world wide, with no shipping and handling. They are less expensive than hard copy, and don't take up living space. You don't have to wait for delievery, just minutes til you're actually reading it. My Books At Amazon.com for Kindle. --journal of my solo Pacific Crest Trail hike in 2001, Campo, California, to Sonora Pass, and then the completion of the trail with Rainmaker, from Crater Lake to Manning Park, Canada. --before and after gear list, photos and descriptions of my pack and tent, with a final base weight (which includes clothing worn) of 8 pounds 2 ounces. --this page will list and give an insider's view into the books I've written, the book I'm working on, and more. Created in August 2011, this dedicated page will give reviews, projects and details relating to each new literary project. --links, hiker friendly data sheet, profile map and basic map, with trail notes for Georgia and North Carolina. Newly added discription of the S.Carolina section which ends at the Foothills Trail intersection. --The next odyssey, complete with an up to date 2004 gear list for the Montana-Idaho section of the CDT, links, and information. My 2003 journal and gear list for the Colorado Trail, which runs concurrent for over 300 miles with the CDT is on this page as well. --links, and trail journal for this trail which goes along the Blue Ridge Escarpment in North and South Carolina. New! Foothills Trail Revisited - April 2009. Rainmaker's Videos Embedded on this page, too. --My first blog (web log). Details about my summer job at Zion National Park , and philisophical musings. Links, vegan recipes and more. The Hobo Series, a page dedicated to alternative ultralight gear,Winter Backpacking Skills, Great Links. Backpacking Recipes coming soon. --Gear reviews, Book reviews, Woman's Page, Fuels for the Ultralight Soda Can stove, Surviving the Road Trip, Links and Quotes. This blog is proving to be very popular, with new stuff added every week. New! Women's Sleeping Bag Review-The Eureka Casper 15 degree, 100% synthetic. I love it! See March 20, 2011 post. --Silnylon Teepee I designed and made November 2002. It weighs under 3 pounds and sleeps 6-8. For a demonstration on how to make your own stuff sacks, including those used in the packless system, click on video link. More how-to films are being planned for my channel at youtube . --the place for ultralight afficionados, recipes, how to pack a bear cannister, build a survival fire, gear reviews, and helpful information about how to make or modify your own gear and useful links. New stuff added periodically. Check it out.